Creative Airwave brings NFC to colourful wireless speakers | What Hi-Fi? 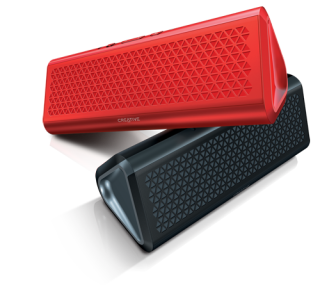 Creative launches Airwave and Airwave HD portable speakers with NFC and Bluetooth connectivity, and the world's first self-calibrating wireless speaker system. Creative is adding to the wireless speakers market with the new Airwave and Airwave HD speakers. These colourful speakers feature near-field communications (NFC) technology for one-touch pairing with NFC-enabled smartphones and tablets. Devices that don't support NFC can still connect via Bluetooth. The Creative Airwave HD features a "Super Charged" amplifier that promises louder sound, aptX Bluetooth audio and AAC codec support for higher quality streaming, and up to seven hours of battery life. You can also connect two different devices to the Airwave HD at the same time. The less powerful Creative Airwave speaker doesn't have the Super Charged amplifier on board, but it does support aptX Bluetooth, and its battery lasts longer at 12 hours. Both speakers are compatible with Apple and Android devices. The portable, prism-shaped speakers are available in a variety of bright and bold colours: the Airwave HD is available in red and black, while the Airwave has a larger collection of blue, pink, green and grey finishes. The Airwave HD costs £130, while the Airwave is yours for £80 – both speakers are on sale now. Also joining the new line-up is the Creative D5xm - the world's first self-calibrating wireless speaker system, available at £280. It's Bluetooth only, and can be calibrated to your room's environment using the Creative Centra app, available for Android and iOS. It's a modular system as well, meaning you can add other D5xm units, smaller D3xm and the DSxm subwoofer (both cost £160) to create up to a 3.1 speaker system. We were fans of the Creative ZiiSound D5x Bluetooth speaker, so we look forward to getting these new Creative speakers in for review very soon.